As I walk out of their little “office,” where I had been using their desktop to do some late-night catching up on the Scramble games that I play with my friend in Saratoga, I come upon my daughter and son-in-law engrossed in their laptops. He’s checking up on the latest presidential campaign issues, and she’s going through her photos to find images that match the series of nature-based poems her father wrote. The television remotes lay on the couch where they were tossed. The only sound is the rustling of pages and the tapping of keyboards. It’s a telling scene for me. We have, as a family, embraced this technology for all that it offers our hungry minds. We are constant learners, thoughtful and curious. The Internet is our classroom. And it is becoming so for my grandson, who is being home-schooled. He not only has his own XO Laptop; with his mom’s help, he uses their desktop to look for and print out images for learning projects, such as identifying animals and their habitats. The world map that hangs from the mantle in their living room is a constant source of questions on his part that he knows have answers somewhere in the great net-out-there. At the moment, I am without a laptop, and I find it a great inconvenience. My old one has a major problem with the port the power cord goes into so that the machine turns off as soon as it is turned on. Now it doesn’t even start because I fiddled with it once too often. I also recently caused the crash of the brand new laptop that I inherited from my once-husband. I guess I got too impatient with Vista, and I am convinced I want to stay as far away from that OS as I can. My plans are to have Vista uninstalled and have a different operating system put in. I’m even thinking about Linux. It’s interesting how quickly we have all adapted to this technology. 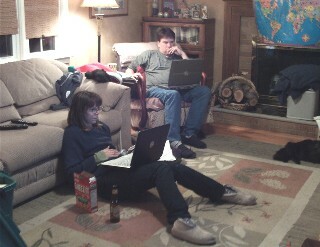 I’m planning to have my laptop repaired before I move into my digs at my daughter’s and son-in-law’s, where wifi rules. This entry was posted in creativity, education, family, television by Elaine. Bookmark the permalink. I got my grandson one of those XO computers. Aren’t they cute and amazing? I wish I’d gotten a Macbook instead of this pc laptop a year ago and am going to get a Mac the next time. That is a cozy picture of your family. I hope everything goes well for you. When do you move in? If you go with Linux (do it 🙂 ) go with Ubuntu – it’s the most user friendly. I only use XP now for logging into work and for Quicken. I hate Vista and when I get my little UMPC, it will have Linux which I’ve tried and find user friendly. We Elders are adapting to a new medium, but think of what’s in store for our grandchildren as this technology advances. There is even a study in progress on implanting a computer chip in the brain of stroke victims, thus enabling them to move objects by thinking. Fascinating.